This guy is a nice simple belt drive with the fancy (adjustable) tone arm and upgradable cartridge, so if you don't need the features on the LP120, and you prefer the automatic stop then this guy is for you. The AT-LP2X combines hi-fi features in a stylish design to deliver stunning sonic quality at a great price. It is perfect if you’re looking for an automatic turntable that will grow with your needs as you build out the perfect home stereo system. It boasts ease-of-use, performance, affordability and options to add-on or upgrade the turntable’s key features. The AT-LP2X is a fully automatic belt-drive turntable with switchable controls to play 12” and 7” vinyl records at one of two speeds—33-1/3 and 45 RPM. Being fully automatic, starting and stopping your records is done simply by pressing the START and STOP buttons on the front of the player. With these controls, you won’t need to manually lift the needle to play your favourite music—the buttons will automatically lift and place the tonearm. Should you wish to do it manually, however, a hydraulically-damped lift control allows the stylus to be precisely and safely lowered and raised at any point on the record. The AT-LP2X’s balanced straight tone arm comes with a 1/2” mount universal headshell and Audio-Technica’s AT91R Dual Moving Magnet phono cartridge with the option to switch it out for other moving magnet or moving coil cartridges. This is all to give you an excellent, high-fidelity listening experience and the flexibility to upgrade. It has an anti-resonance, die-cast aluminium platter with a felt mat; boasts a damped base construction for reduced low-frequency feedback; and includes a 45 RPM adapter and hinged, clear-smoked, dust cover. On the back of AT-LP2X is a PHONO/LINE switch; an attached dual-RCA output cable; and an AC input to connect the included power cable. Depending on your setup, switch the PHONO/LINE switch to LINE when you are using the AT-LP2X with a stereo preamp, or to PHONO—which will turn on the internal preamp—when you are connected directly to speakers. SIDE NOTE: Don't buy electronics from overseas! Even if you get a transformer, you will be buying a product that is not supported locally for service or repairs but FAR MORE IMPORTANTLY it will not have passed the Australian Government's QC inspectors and will therefor be illegal. This means that you will be legally liable if anything untoward (read, burn your house down or electrocute someone) happens and insurance will not cover it. True Story. 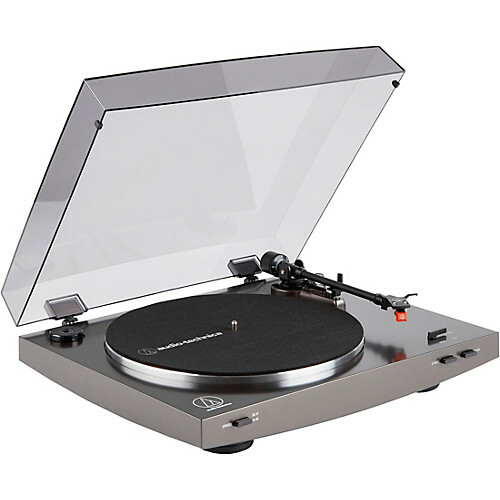 And now, our two most popular decks; the Audio-Technica LP60 and LP120.